Principal Cast : Jason Momoa, Amber Heard, Willem Dafoe, Patrick Wilson, Dolph Lundgren, Yayah Abdul-Mateen II, Nicole Kidman, Temuera Morrison, Ludi Lin, Randall Park, Graham McTavish, Michael Beach. 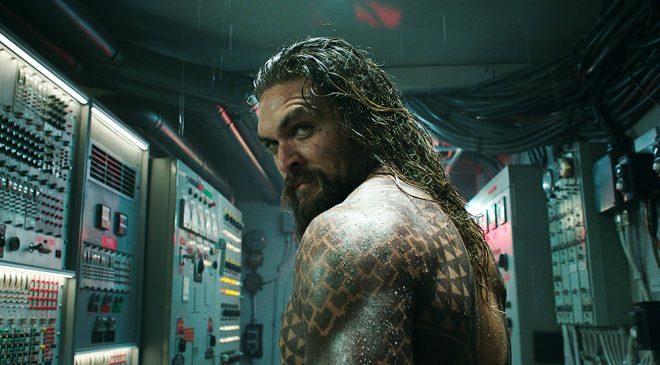 By far the breakout character from DC’s “Snyderverse” version of its cinematic universe, established by Zack Snyder through Man of Steel, Batman V Superman, as well as Patty Jenkins’ Wonder Woman and the jigsaw puzzle of Justice League, has undoubtedly been Jason Momoa’s Aquaman, a ‘roided-up surfer-dude type as blokey-bloke as they come: the perfect antithesis of comic-book’s angst-ridden king of the seas Arthur Curry. Established horror director James Wan, best known for his Insidious and Conjuring franchises, takes on one of the “sillier” DC characters in the underwater fish-man, bringing his energetic visual style and the hyper-kinetic storytelling bravura established in his Fast & Furious instalment to deliver a rousing, crowd-pleasing aquatic adventure in Aquaman, a film long joked about but now given life and love on the big screen. Surface-dwelling superhero Arthur Curry (Momoa) is forced to confront the past when the King of Atlantis, King Orm (Patrick Wilson) declares war on the humans above. As the firstborn son of Queen Atlanna (Nicole Kidman), Arthur has a claim to the throne, but seeks it not. 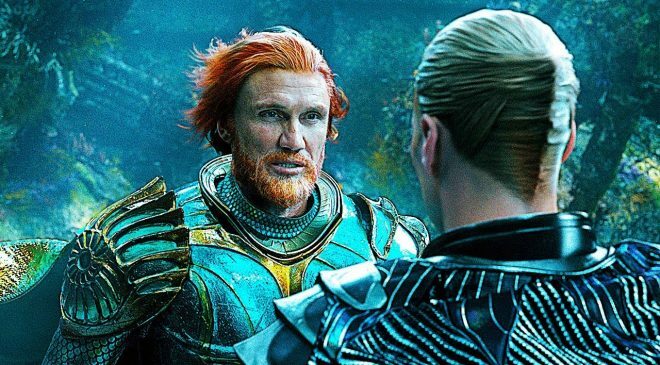 However, at the behest of former trainer Vulko (Willem Dafoe) and Princess Mera (Amber Heard), daughter of King Nereus (Dolph Lundgren), Arthur searches for a mythical Trident of Atlan, which will bring about the halt to impending war. Meanwhile, the villainous sea pirate, the Black Manta (Yahya Abdul-Mateen II) vows to kill Arthur following the death of his own father. There are words to describe Aquaman. Most of them are synonyms of “bonkers” or “batshit crazy” so you get the general idea. Skewing far to the crazy of the established DC Extended Universe aesthetic, Aquaman’s incredibly fast-paced narrative and complex interweaving of just about all DC’s established mythology surrounding the character might seem like a hodge-podge of insanity wrought on the big screen, and you’d be correct. Under the steerage of James Wan, the hero’s first big-screen adventure is exactly that – an adventure – in the grand tradition of pulp serial films only with a far higher budget. It’s a breathless, labyrinthine-like, endlessly inventive excitement generator, this movie, especially if you’re a fan of the character and his storied history, the most popular iteration of which plays out in this retelling, and for folks who know nothing about the character other than the (relatively) brief introduction we got in Justice League, you’ll be caught up in no-time. Written by David Johnson-McGoldrick and Gangster Squad’s Will Beall, Aquaman doesn’t waste time with quiet contemplation when it can deliver sonic booms of underwater action made possible by the latest in Hollywood digital effects. 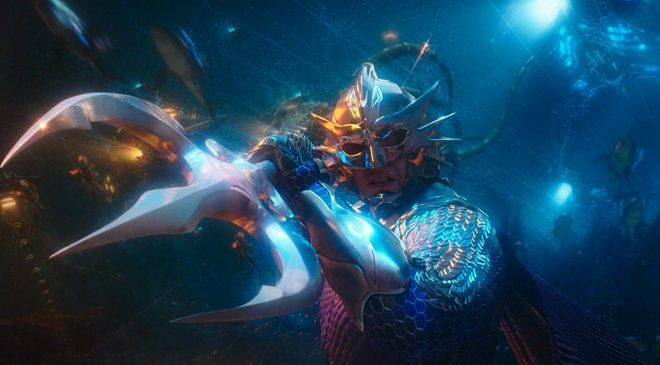 From the desert sands of the surface to the trenches beneath the bottom of the ocean, Aquaman is truly global in its search for action, and Wan’s pulse-pounding direction, which incorporates exposition within much of its gob-smacking action sequences, is brilliantly staged. Arthur’s personal journey of discovery, his redemptive arc as it were, is built through the film via flashbacks to his childhood, and his friendship with Vulko, and by the end we have a far more empathetic vision of the character’s motivations than just the bitter, tattooed fish-man we saw hitting on Wonder Woman in Justice League. 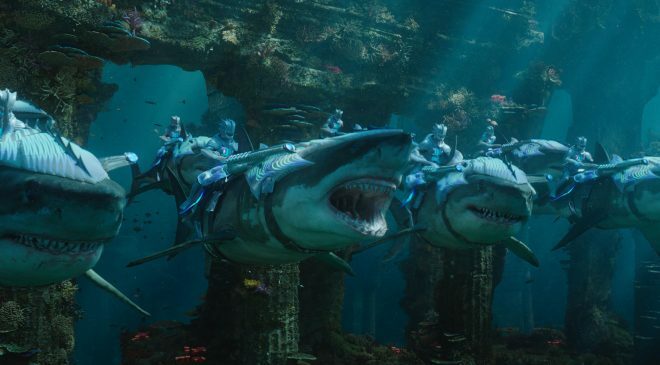 The balance between world-building and out-and-out action is tenuously delicate, the film populating the seven kingdoms of the sea (of which Atlantis is central) similarly to Patty Jenkins’ Wonder Woman did for Themyscira. Momoa, reprising the role of Arthur, continues with the love-it-or-hate-it beefcake rendition of the character – self described as a “blunt instrument” at one point, Arthur’s combative style and pulverising brawling tactics make him a Schwarzenegger-like force of nature to contend with. Momoa ain’t too flash at the dramatic moments, unfortunately, but more than makes up for the character’s deficit with subtlety with sheer charisma and dry wit. 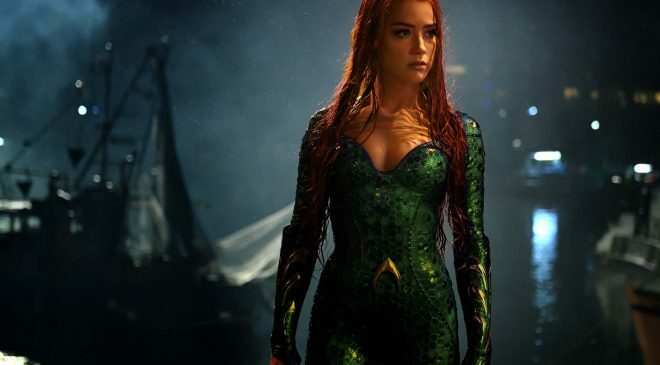 Arthur’s love-interest, Mera, brings her own brand of heavy-hitting, with Amber Heard doing a solid job delivering dialogue beyond her ability with surety and complexity, turning a character I typically find too aloof in the comics into something approachable in the movie. 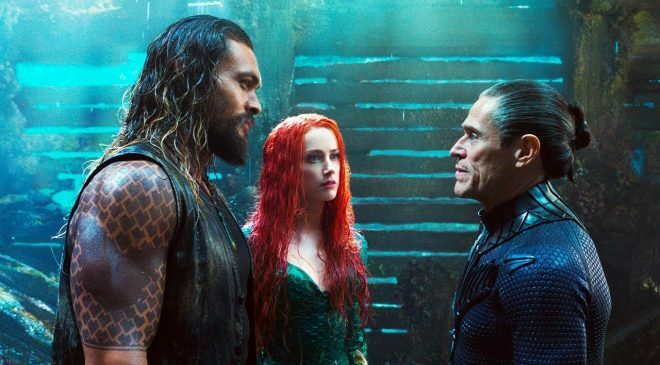 The banter between Momoa and Heard is a delight of sarcasm and wry irony, juxtaposing the upper-class arrogance of Atlantean nobility with the grit-n-grime earthiness of the surface being a surefire way to create sparks. 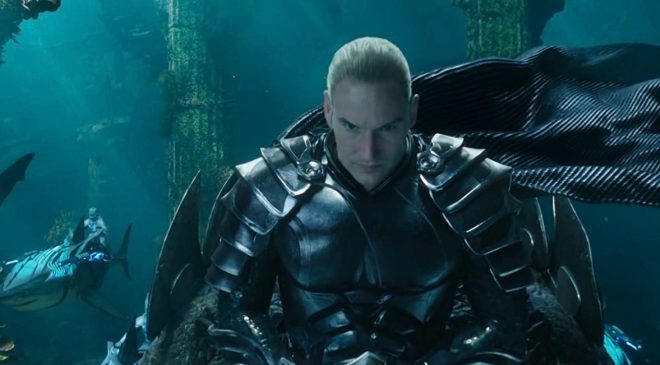 Supporting roles to Patrick Wilson, as Orm, the film’s primary villain, and Willem Dafoe, as Vulko, Orm’s vizier, as well as Nicole Kidman and Temeura Morrison, bring a sense of credibility to a property once derided by both fans and non-fans alike, and seeing Dolph Lundgren do a halfway decent job of playing Nereus is something to behold. Of course, the film’s beefcake surface-dwelling bad guy, Yahya Abdul-Mateen II’s vengeful David Kane (aka, Black Manta), is singularly one-note and predictable – hell, if he hadn’t been where he was in the first place, his quest to kill Arthur wouldn’t even be a thing, so he’s technically a product of his own failure – but Abdul-Mateen II delivers a rousing, crowd pleasing performance. Naturally, Aquaman is flooded with visual effects, most of which occur beneath the waves. Arthur being Arthur, his ability to travel beneath the sea looks a lot like Superman flying above the clouds, so one might see similarities in the visual motifs of both this film and Snyder’s Man of Steel, but where Aquaman really comes into its own is the design of the entire undersea kingdoms. And they truly are a thing of beauty. Atlantis, its history and the people now living in its shadow are gorgeously designed, from the general plebs and citizenry to the solders and armies of the sea, everything about Aquaman’s production design is eye-wateringly cool. 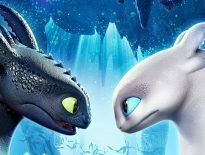 The film just clicks when it’s beneath the waves, delivering breathtaking vistas, effects and battles – all of which contain a multitude of sea creatures that appear in ways you’ve only ever dreamed of. The film’s climax features a spectacular undersea battle that absolutely boggles the mind, a clash of titans that definitely puts that Sam Worthington monster movie in the shade. In terms of pure spectacle, Aquaman is absolutely aces. It’s also a little silly at times, with its vaguely Indiana Jones-esque quest subplot and exploratory shenanigans giving us some time above the water in dusty old temples and things; the film apes a lot of motifs from not just Spielberg’s iconic archaeologist but also Stephen Sommers’ Mummy movies and old 80’s adventure larks such as The Goonies and Romancing The Stone, dabbling in good old fashioned globetrotting to establish its hero as worthy of being the king. It’s a far cry from Batman V Superman, as far as you can possibly get, and in truth I loved it for entirely different reasons. While the entire film is a load of absolute nonsense, it’s delivered to our eyes and ears with a truly remarkable precision strike by James Wan. 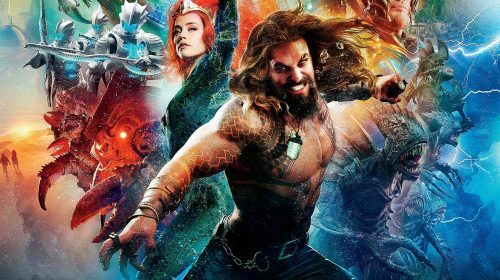 His camerawork is ferocious, a swirling hurdy-gurdy of balletic action, hugely entertaining fight sequences and energetic effects work, coupled with Rupert Gregson-Williams’ thunderous score (he’s no Hans Zimmer, for sure, though) and Aquaman delivers honest-to-god escapist fun that skims the surface without really going to deep into emotional investment. It’s a film you’d describe as “rollicking” and leave it at that. 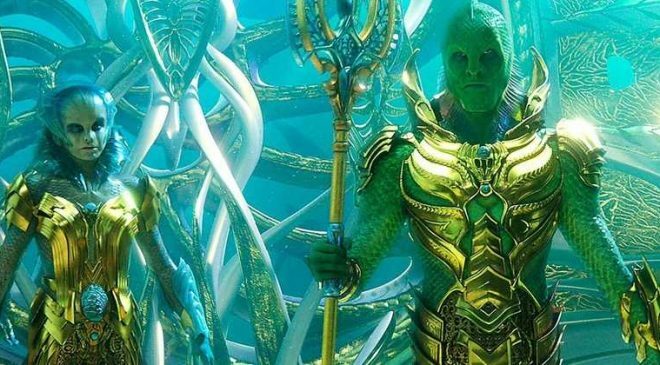 A blast of watery comic-book goodness with more than enough laughs and plenty of cool moments to savour, the once-comical Entourage running-joke myth of Aquaman being unfilmable nonsense has been pushed aside, with the torment of DC’s seemingly irretrievable franchise ship suddenly course correcting in the most emphatic manner possible. Aquaman is blockbusting comic-book filmmaking that answers the question of whether or not the King of The Seven Seas could make the transition to become King of The Big Screen. The answer is yes. Yes he can.